Even for an observer, covering the war in Syria for the fourth winter now, it was an odd, new and strangely also beautiful thing to see what a layer of thick, wet snow brought to the south of the country today. Despite reports of the first refugees in- and outside Syria freezing to death due to the unusually cold weather in the region, fighting at all fronts from Daraa up to the capital region Rif Dimashq came to a sudden halt today as for the same reason. 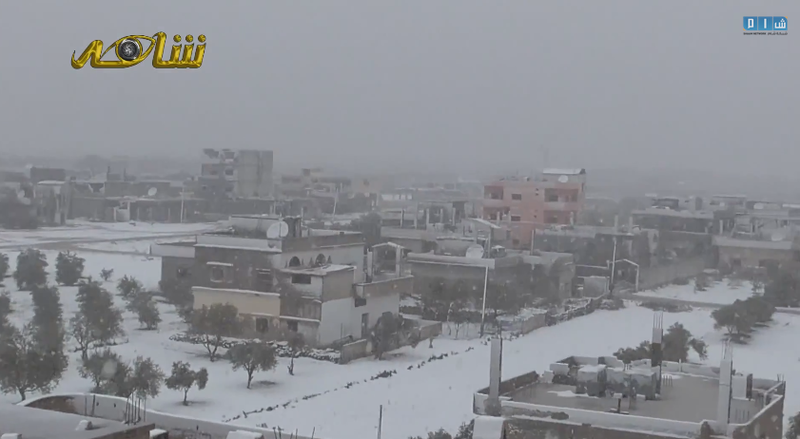 The town of Inkhil, – “Angel” in English – which saw hundreds of Assad air force raids and thousands of deaths caused by them looked peaceful in dense snowfall today, as did other cities like usually embattled Shayk Maskin. Also in the Damascus area of Jobar, which is one of the hardest and most destructive battles in southern Syria, raging at the same place for 40 months now, no air raids and only very few artillery strikes and direct encounters were reported today. Syrian rebels – no. 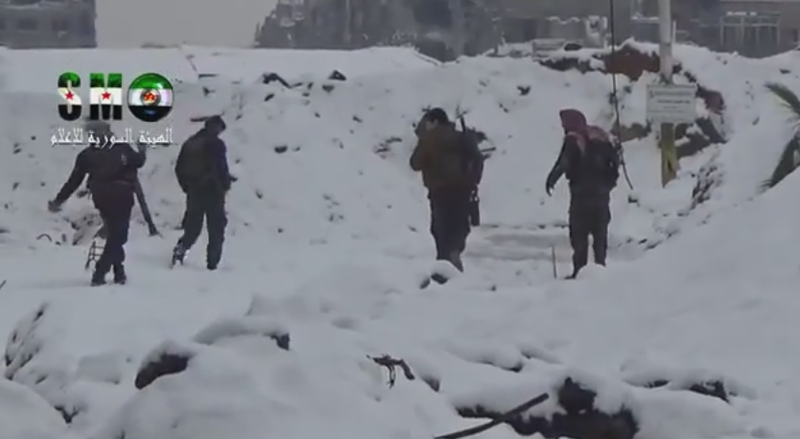 no “islamist extremists, but people, defending their homes against the murderous Assad regime – used the unexpected lull for a little snowball fight, enjoying the short period of relaxation. 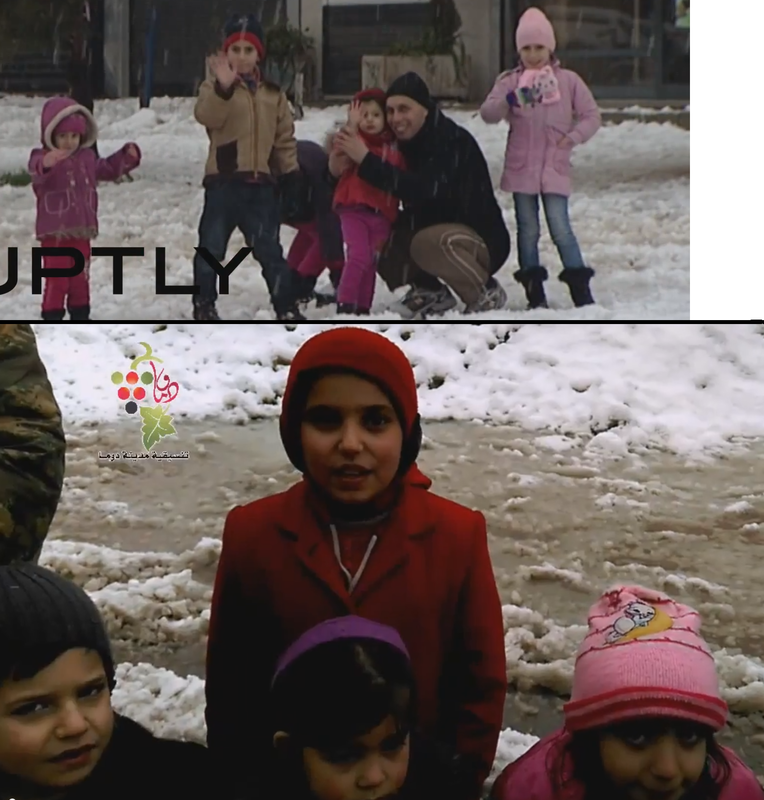 And last but not least, children – the most innocent victims of the war in Syria, entering its 5th year now – used the “white miracle” for some fun or at least distraction, however under different preconditions… The upper part of the picture shows children playing in the snow with their parents in the Assad regime-held part of Damascus. Children which seem for some reason – sectarian belonging, allegiance of their parents or just the geographic location of their homes – more worthy to live for the dictator than other. The lower part of the picture shows children living 5 km north east of Damascus in the suburb Duma. For the same reasons as called above, those children are not worth living for the Syrian dictator, forcing them to live in shelters and having lost most of their relatives and friends during the last four and a half years. Worlds apart, some living in relative calm and security, others in the middle of the horrors of Assad’s war, a look into the faces of ALL of these children shows their happiness with the situation in that very moment, no matter what. Realizing this, every human person must see the senselessness and absurdity of this war and armed conflict affecting innocents in general. Children are children, not more or less worthy lives, just because of their ethnicity, belief or the political alignment of their parents. It is simple as that. Every emphatic person should understand that and every government believing in children –> human rights, should do everything in its power to protect children from a regime or entity that decides about life or death by such distinctions. Coming back to the initial situation of this little as optimistic as possible article on Syria it remains to say that it is a good feeling that – even in Syria – at least the weather in general and snowfall in particular do not distinguish between humans and – at least for a short period of time – brought peace to some of the most affected of the war in Syria. However snowfall will end and after that, it is once again up to the global community to stop that war by all available means. This entry was posted in Syria by Julian Röpcke. Bookmark the permalink.